Posted on June 28, 2011	by . Here is a guest post from Chad Newton, who I met at our ill fated Roosevelt happy hour. Chad describes himself as “a sustainability enthusiast, data geek and environmental engineer at Gray & Osborne, Inc. in Seattle.” He’s also responsible for Build the City, an awesome data driven blog about global urban and environmental but with a focus on Seattle. Build the City has some of the best maps based on 2010 census data that I’ve seen. I have created a map of average household size in the City of Seattle based on the U.S. Census 2010 data (other census maps are posted at Build the City. Planners typically use an average household size between 2 and 3 over wide areas to calculate other planning variables. But household size itself is a variable that varies with neighborhood and housing type. 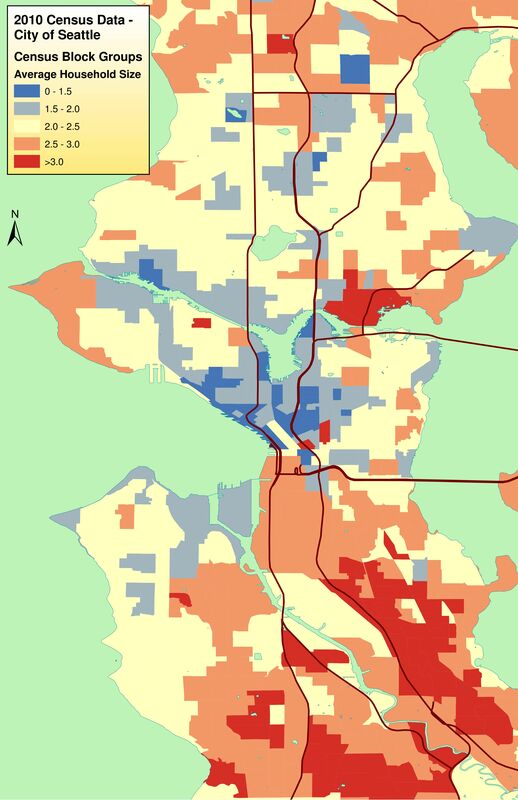 The map below shows average household sizes for Seattle, on the basis of census block groups. The data from the U.S. 2010 Census is not without flaws, particularly around universities, where I suspect some dorms are counted as single housing units. But its the best we got. There is a clear trend visible in the map (larger version here), with downtown and adjoining neighborhoods, together with a few urban villages, having the lowest household sizes. The largest household sizes are found in southeast Seattle neighborhoods with an abundance of subsidized family housing. Do families instinctively eschew urban neighborhoods such as downtown? Perhaps, but we haven’t really given larger households options. Redfin, a popular real estate listing website, shows 677 studio, one and two bedroom homes for sale currently in central Seattle, and only 63 three bedroom and larger homes. Some recent downtown luxury high-rises (like 1521) have included large units at high prices, so there must some demand. Why are three bedroom apartments and condos so rare in the city, particularly affordable ones? The economics of new construction play a factor: people will pay more per square foot for a tiny one bedroom unit than for a larger home. Based on a quick review of rental prices in a few apartment complexes, three bedroom homes rent for 50 to 67 percent more than one bedroom homes, despite having proportionately more space. Larger homes in urban neighborhoods to increase diversity and support a full lifecycle environment. Three and four bedroom apartment flats are common in European cities, where they are often house one extended family or are shared by flatmates. Sharing apartments or houses leads to a lower cost per person, a benefit for consumers and affordable housing. Sharing of homes results in more efficient use of appliances and utilities, a benefit to the environment versus everyone living in separate one bedroom apartments. But larger urban apartments could result in lower profits for developers and building managers. A potential solution to the dearth of family-sized housing in the urban core: the City’s existing Multi-family Tax Exemption program could be tailored to support affordable three bedroom and larger units. That’s an excellent graph. What jumps out at me is all of the housing that’s under 2.5 people per residence. Considering that Seattle is something like 80% single family homes, it sure looks like most of these homes are occupied by singles and couples. Look at Queen Anne, Fremont, Wallingford, and Ballard. Other than the red dot at the university there’s almost nothing over 2-2.5 people per home. But this is all area that’s practically covered with single family homes. People have argued that familes want a yard, etc, so we shouldn’t build more condos. But it seems more like couples and singles are buying SFH’s because condos and apartments are too expensive for what you get. And why are condos expensive? Because there aren’t enough to meet demand. Build up, and you’ll bring families in that would rather live in interesting places than have a yard, but you’ll also free up some of our SFH’s for families rather than couples. Are you sure about that? The space, I mean. In my experience (which, to be fair, is only in the sub-$1000 market), 2 and 3 bedroom apartments are often not significantly larger than 1 bedroom units – they just have more walls and smaller rooms. I would also REALLY love to see your $/sqft numbers. It’d make an interesting chart. I totally agree that we need to encourage 2 & 3 bedroom units in the city. Most of the “affordable” rentals seem to be studios or 1 bedroom units – not well suited to couples or families. I would be interested in discussion of the idea of removing the means-testing for MFTE, and replacing it with a requirement to include 3- and 4-bedroom units at market rates. From a developer point of view, it would reduce reporting costs and allow more flexibility on rents. From an accountability standpoint, it it seems like a physical unit is more certain than the promise to ask questions about what people’s income is. From a City polciy point of view, it gets at one area that the market is not producing much of, and that we need if we are to have any kind of family size diversity in urban centers and villages in the long run.